Carrying a car seat through the airport can be a drag. Solution? The JL Childress Wheelie Car Seat Travel Bag. Heavy duty denier nylon protects your car seat investment from moisture, scartches, dirt, and germs. Reinforced seams stand up to just about anything. Dual rubber wheels and an adjustable pull strap allow you to roll even the bulkiest of convertible car seats to your gate. A hard bottom and resting pegs add durability for years of use. On the plane, just store the Wheelie bag in the overhead compartment. 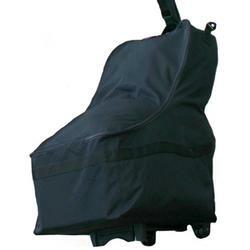 With generous dimensions, the Wheelie Car Seat Travel Bag holds most car seats. The lockable double zipper opening makes it easy to put your car seat in and take it out of the travel bag while the adjustable interier cinch strap keeps the car seat secure. A removable shoulder strap attached to a D ring makes for easy pulling through airports. Hard bottom and resting pegs keep car seat and bag up off of the ground. If your car seat is not specifically mentioned here, we recommend you measure your seat and compare its dimensions with those of the Wheelie travel bag. The Wheelie Car Seat Travel Bag does not fit the Britax Regent, Recaro Signo, Cosco Summit, or Evenflo Appolo.